We have a full calendar of exciting, high-quality race events for everyone from the serious competitor to those who participate solely for fun and fitness. Register today for one of our races and find out for yourself what makes VR PRO events the best! And please keep checking back as we are always adding new events. Our original race was the Downtown Dash in 1994, which took place in Downtown Burlington. This first ever 5k race had 160 runners. We then decided (along with enthusiastic running groups from our store at the time, The Village Runner) that we would create a half marathon. Beginning the following year, that race started at the Oakville Village Runner and finished at our Burlington Village Runner. For that very first year we had over 250 runners with proceeds from the event going to Halton Women’s Shelter. That race (now the Chilly Half Marathon) has carried on over the past 22 years to become one of Canada’s premier half marathons with thousands participating each year including many world-class runners, as well as elite Canadian athletes and Olympians. In 1999 the first ever Burlington Marathon was initiated and the response was amazing. The Burlington Rock ‘N Roll Marathon, Half Marathon and 5K continued for 5 years until it outgrew the city. There still may be another Marathon in the future. VR PRO continued to organize new races every year including the Canada Day 5K, Waterfront Trail, Hannukah Hustle, Disco Dash, and Jingle Bell Race, which eventually became the Santa Burlington 5K, Canada’s First and Largest All-Santa Race Event. Our All-Santa Races became so popular we eventually organized similar events in Hamilton, ON and Burlington, Vermont as well as several other cities! their most popular events; allowing runners and walkers to participate in these great race events from anywhere in the world! Visit the events page for more information about VR PRO races and a full listing on this year’s calendar of events. 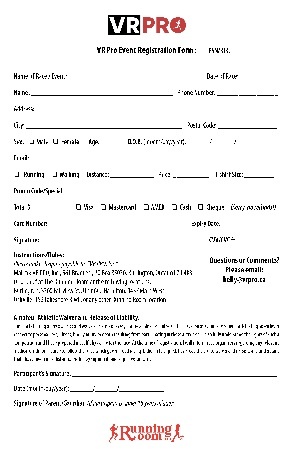 Or, click on any of one the race logos to register for that event. We are VR PRO! For over 22 years, the team at VR PRO has been putting on exciting running events throughout the Greater Toronto Area and beyond. We recently celebrated raising over three million dollars towards local charities. Watch video reviews of the Chilly Half Marathon & Frosty 5K from Get Out There Magazine and see for yourself why everyone loves a VR PRO event! 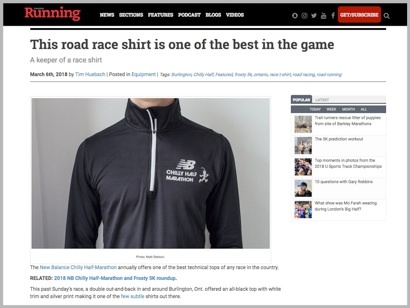 Read what Canadian Running Magazine had to say about the 2018 New Balance Chilly Half Marathon. Learn more about QuickStrip™ products from Rapid Dose Therapeutics at rapid-dose.com. Although there was a tragic incident at the finish line of this year's New Balance Chilly Half Marathon, we are so pleased to tell you, this story has a very happy ending! Run With Us...Wherever You Are!